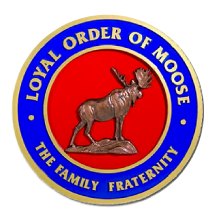 The Loyal Order of Moose is a fraternal and service organization founded in 1888 with nearly 650,000 men in roughly 1,600 Lodges in 49 states and four Canadian provinces, plus Great Britain and Bermuda.Along with other units of Moose International, the Loyal Order of Moose supports the operation of Mooseheart Child City & School, a 1,000-acre community for children and teens in need, located 40 miles west of Chicago; and Moosehaven, a 70-acre retirement community for its members near Jacksonville, FL. Additionally, members of the Moose conduct approximately $70 million worth of community service (counting monetary donations and volunteer hours worked) annually.The Loyal Order of Moose organizes and participates in numerous sports and recreational programs, in local Lodges and Family Centers in the majority of 44 State and Provincial Associations, and on a fraternity-wide basis. Lodges across the Fraternity are known for creating life-long bonds between members through activities and a shared concern for children in need, seniors and the communities in which they live. Copyright 2016. All Rights Reserved by Moose International.